British Correspondence Chess Championship (BCCC). Held annually since 1921, this is our premier event designed to determine the best CC player in Britain. See BCCC News, British Champions, BCCC Rules and BCCC Fees. Now played exclusively as a web server event. 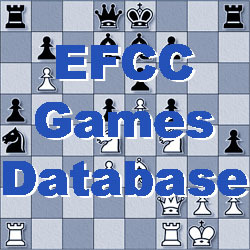 All crosstables can be viewed at: https://www.iccf.com/tables then "National Tournaments" - "England" - "British Championships". Usually consists of a Final, a Candidates section and then Reserves sections. FINAL - The Final is a 15 player all-play-all with each player having 14 games. Very tough competition - this is British CC at its best. To ensure continued high playing standards & to reduce the need for adjudications, the BCCC playing time has been extended to 21 months. From 2013/14 onwards, there will be two Finals running concurrently at any one time. The 2016-18 Final https://www.iccf.com/event?id=61304 is an International Title tournament at Category 5. CANDIDATES - Played annually with the players finishing 1st & 2nd promoted to the Final. The last 3 years have seen 13-player events. All-play-all playing each opponent once. RESERVES - All players not qualifying for the Final or the Candidates can play in the Reserves. It is open to everybody! The winners are promoted to the Candidates.